The Republic of Colombia is located in the northwestern portion of South America, with one coastline on the Pacific Ocean and another on the Caribbean Sea. 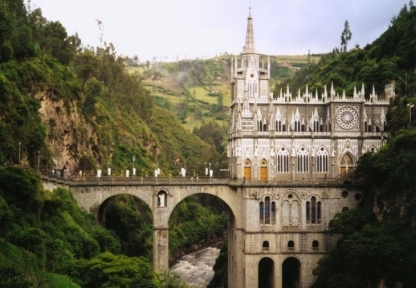 The Andean cordillera runs through the country, which also has tropical rainforests, plains, and numerous large rivers. Interestingly, despite the diverse terrain, Colombia’s population is quite homogeneous. Colombia’s economy is strong, with over a decade of sound performance even including the recession years. Free trade agreements have benefited the country greatly, although the emphasis on oil production renders Colombia vulnerable to changes in petroleum market prices. Despite some trade issues, Colombia and the United States maintain a harmonious, cooperative relationship. The Boren Awards, funded by the National Security Education Program (NSEP), encourage students to travel and study abroad in countries that are both valuable to American interests and traditionally less likely to be chosen for such travels. The Boren initiative offers scholarships worth up to $20,000 for undergraduates and $30,000 for graduate students. Language study is a required component of Boren education, and while Spanish (the official language of Colombia) is not on the list of preferred languages, you may make a case for studying the Spanish language if you are already at a high level of proficiency. If your major field is in science or engineering, an intermediate level is acceptable. You must describe how your study plan will help you make a contribution to national security. The Benjamin A. Gilman International Scholarship Program was established in 2000 as a means of giving financially disadvantaged undergraduates the means to study abroad, thus diversifying the group of American students at foreign universities. You must be a Pell Grant recipient to apply. As of 2012, the Gilman program awards more than 2,300 scholarships each year, for as much as $5,000 each, and you may qualify for an additional $3,000 if you are studying a language found on the Critical Need list. The Fulbright program, designed for graduate students, has six grants allocated to study in Colombia. Fulbright requires proficiency in Spanish and prefers candidates who plan to accomplish a specific goal in their studies. Your ground travel in Colombia must be approved beforehand, and be careful when presenting your study objectives: some parts of the country may be off-limits, and if your research includes any that will weaken your application. The Whitaker International Fellows and Scholars Program sends graduate students in biomedical engineering abroad for one academic year. The grants include travel and living expenses, insurance, and other perquisites. Grants range up to $35,000. The Rainforest Alliance, a nonprofit interested in preserving rainforests, sponsors the Kleinhans Fellowships, which provide funding to graduate students who want to conduct research in the Colombian rainforest region. The fellowships are intended to produce viable means of extracting rainforest products like medicinal plants and nuts without damaging the forests themselves, so applicants should be familiar with both ecology and business principles. Grants last two years and bring $16,000 annually. The Kleinhans judges look for feasible plans with commercial potential, and investigate the backgrounds of those who apply to verify their qualifications. The Garden Club of America hands out a number of scholarships for botany studies ideally suited to the tropical rainforest. The obvious choice would be the GCA Awards in Tropical Botany (two grants for $5,000 each for independent field research in the tropical zone), but there are also other options such as the Anne S. Chatham Fellowship in Medicinal Botany ($4,000 to collect information about medicinal plants). The Conference on Latin American History underwrites the James R. Scobie Memorial Award for up to $1,500, given to graduate students doing research for a dissertation involving Latin American history. Trips are intended to be 4-12 weeks in length, and you must submit a prospectus of the work you intend to undertake. The Henry B. Cowhey Scholarship in Tropical Conservation is for those pursuing studies in tropical conservation biology, and it is worth $2,000. The John Denver Memorial Scholarship in Tropical Ecology provides between $2,500 and $4,000 for field research. The Stephen Mitchell Doyle Scholarship in Tropical Ecology ranges from $2,000 to $4,000. The Jane Harris Scholarship in Tropical Botany is for those focusing on endangered plants and ecosystems, and it brings $1,000. NOTE: If your country of choice is under an official travel warning, that may affect any applications you submit. Please check application requirements carefully. The latest travel warning extended for Colombia is dated February 21, 2012 and has not been rescinded as of September 16, 2012.